Anyone who thinks that Brecht is intimidating and difficult should see the red light district/karfiol kollektiv’s production of The Resistible Rise of Arturo Ui. Ted Witzel’s direction is consistently inventive, the young cast give vibrant performances and the audience is wildly enthusiastic. In 1941 Brecht wrote this story about gangsters as a satiric parable of Hitler’s rise to power. Far too many productions, however, focus on the tenor of Brecht’s metaphor, not on the vehicle. Witzel does not make this mistake and as a result his emphasis on the gangland politics gives the play even greater resonance. The action is set in Chicago in the 1930s and follows efforts of various groups to control the vegetable trade. When the members of the Cauliflower Trust (a grocers association) persuade the mayor Dogsborough (Tyler Hagemann) to accept a shady deal because the Trust has always supported him, local gangster Arturo Ui (Daniela Pagliarello) sees a way to rise. He will force the Mayor not to prosecute his protection racket in return for not revealing the Mayor’s indiscretion. When the Mayor refuses, Ui’s men set fire to the dock warehouses to prove they need Ui’s protection and the fire is pinned on an innocent man. Eventually, by means of a forged will, Ui inherits Dogsborough’s power and begins to concentrate on how to expand his control to the neighbouring city of Cicero. There is a one-to-one correspondence between the characters in the play and the historical characters they represent. Ui is Hitler, Dogsborough is Paul von Hindenburg, Emanuele Giri is Hermann Göring, Givola is Joseph Göbbels, and so forth, while Chicago is Germany, Cicero is Austria and the warehouse fire is the Reichstag Fire of 1933. Most productions destroy Brecht’s allegory by focussing on the historical characters and parallels that Brecht chose to satirize as common thugs involved in controlling the vegetable trade. Canadian Jennifer Wise’s fine translation that Witzel uses, makes this point clearly in her introduction to her translation: “Rather than theatricalizing Nazis ... the play is designed to do something much more valuable: give us a cautionary tale about the conditions under which fascist brutal force can triumph anywhere, even in democracies with proper legal institutions”. It is this course that Witzel admirably follows. Not only is Witzel’s Ui one of the first not to have a toothbrush moustache, Witzel has Ui played by a woman. Brecht is noted for his avocation of the Verfremdungseffekt (“alienation effect”) or the promotion on non-naturalistic techniques in drama to keep the audience aware they are seeing a play. The use of songs and projected scene titles are some of those techniques, but Witzel has found another simply through his cast where nine of the fourteen actors are women, all but one playing male roles most of the time. Witzel does use the projected titles to relate events onstage to their historical counterparts, but he also uses them to ask us to think of events since World War II when similar situations occurred. He has had the gruesomely comic idea of using the projections to keep us up to date on the body count during the play. Other imaginative uses of the V-Effekt include having the aged Dogsborough, who is used as puppet by his power-hungry son (Fiorella Pennano), actually have strings attached to his wrists so that the son manipulates the father like a marionette. The gangsters wields obviously cardboard guns. And Witzel uses music from the 1930s to the present and from East and West deliberately to universalize the action. The playing area has the audience situated on three sides and since there is no fourth wall in Brecht audience members should expect that characters will directly interact with them. Witzel directs with a clear vision that often makes Brecht’s parodic gangland fable into a fascinating precursor of films by Martin Scorsese. The main problem is that Witzel’s cast is highly uneven. Witzel happens to have directed the same cast in the play in January this year when they were fourth-year students at York University. The enthusiasm and vitality is certainly present, but subtlety often is not. The finest performance comes from Sheri Godda, who not only plays a French maid, but the serious male roles of Sheet and O’Casey and the comic washed-up actor Mahoney to great effect. In this last role, Mohoney’s efforts to teach Ui (without being shot) how to walk, speak and sit like a stage actor are the comic high point of the play. 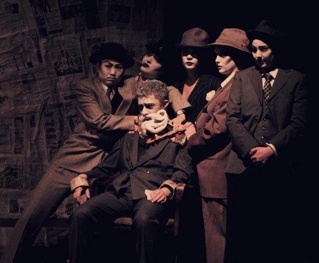 Other successful performances come from Josh Johnston as Ui’s psychotic henchman Giri, Mishka Thébaud as Ui’s more cautious supporter Givola, Rose Tuong as the syndicate man Flake and as the Prosecutor, Tiana Asperjan as Clark and Eric Rich as Dullfleet, the representative of Cicero who fatally spurns Ui. Daniela Pagliarello gives a very strong performance as Ui and really captures the essence of Brecht’s notion of him as a petty thug who sees his chance to make it big and takes it. What is missing is a clear presentation of Ui’s growth of ambition. Her Ui is always so sure of himself that we don’t get the sense that we do with Richard III or Macbeth (with whom Ui is compared), that he is walking on a tightwire that could collapse if enough good people finally decided to do something. Witzel has had the brilliant idea of working Pagliarello’s talent as a tap-dancer into her performance so that in the massacre of Scene 12, her tapping represents the machine gun fire, after which she does an amazing tap solo, rather as if Ui were reflecting on his triumph, that deserves a round of applause on its own. If you have never seen Brecht before, this Arturo Ui would be a good way in since Witzel has made it so accessible and integrated Brecht’s “alienation effects” so well into the comic tone of the work. If you have seen Brecht before, but not this play, you will be bowled over by the energy the cast brings to the work and by the unfaded relevance that scene after scene so presciently evokes. Photo: (from top) Daniela Pagliarello as Arturo Ui; the Cauliflower Trust surround Mayor Dogsborough. ©2013 the red light district.